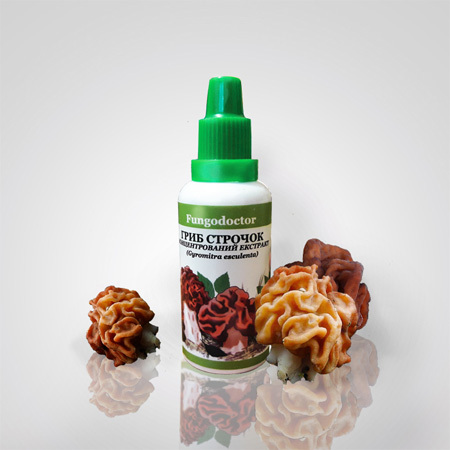 Extract of fungus stitch (Gyromitra esculenta), an auxiliary substance propylene glycol. Homogeneous transparent liquid of brown color with a pleasant mushroom smell. It is allowed to form a small amount of sludge at the bottom of the vial. Extract composition: contains polysaccharide CT-4, analogous to chondroitin, antirheumatic substance, similar in action to cortisone, possessing powerful anti-inflammatory action, vitamins of group B, PP, A, a significant amount of microelements. It has antitumor, anti-inflammatory, chondroprotective action. 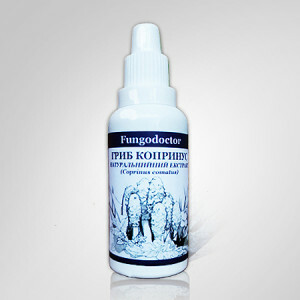 It is recommended for oncological diseases with lesion of the osteosynthesis apparatus. Broncho-pulmonary diseases with sputum and respiratory distress. Improves digestion and pancreas function, increases appetite. It is recommended for diseases with a decrease in appetite and functional activity of the gastrointestinal tract, pancreas diseases. It has a high antioxidant activity that improves metabolic processes in the vessels and muscles of the eyes. It is recommended for the treatment and prevention of myopia, hyperopia, cataracts and glaucoma. To increase the effectiveness of the drug is recommended to take it in combination with vitamin C.
Contraindications: individual intolerance, children up to 12 years, cardiovascular diseases in the stage of decompensation, are not recommended for pregnant and lactating women.